…That was the theme of Woolworths’ 1998 Christmas TV advertisement, in the heady, Tellytubby days when, as the ad reminds us, everyone wanted a Talking Po. This festive season, the incessant snow and ice has certainly made it a Winter Wonderland in the various town centres that I visited. However, 2009 has, of course, been the first Christmas without Woolies on the high street, meaning that shoppers have had to look elsewhere for their Barbies, PlayStations, and whatever the current equivalent to a Talking Po is. Trudging through the wintry conditions, I did manage to snap a few more ex-Woolies stores during the last fortnight. 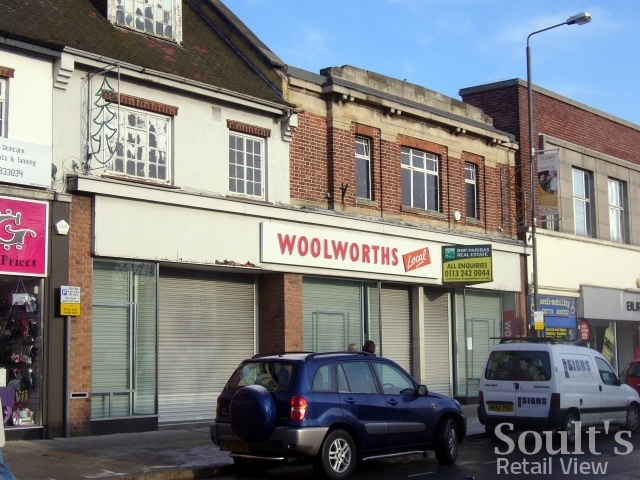 Interestingly, unlike my last set of pictures, where most of the former Woolworths sites that I visited had been taken over by other retailers, many of the latest batch remain vacant. 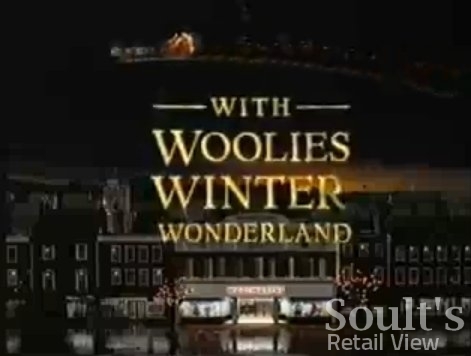 The former Woolies up first is a bit of a cheat, in that it’s not one of the 807 stores that closed down following Woolworths’ collapse into administration last year, but is one that had already shut – and been taken over – shortly prior to that. The former out-of-town Big W at Tamworth’s Ventura Park is certainly one of the more shortlived Woolies stores (having opened, I think, in summer 2001), as well as one of the larger stores to open in recent years (90,000 sq ft). 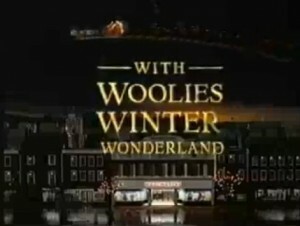 The shop lasted only until late 2004 in its original form, when it was split into two: Woolies kept the left-hand half (rebranding it from Big W to Woolworths), while the right-hand half was subsequently taken over by Marks & Spencer, which opened its own store there in November 2005. 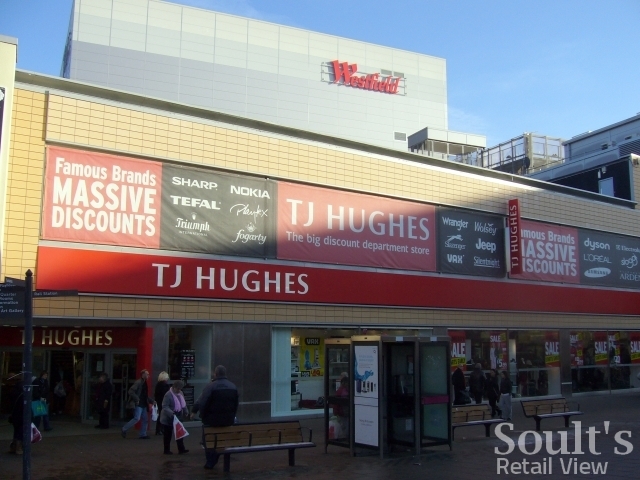 Over in nearby Burton upon Trent, in contrast, the former Woolies in the Coopers Square shopping centre is yet to find a new occupant. 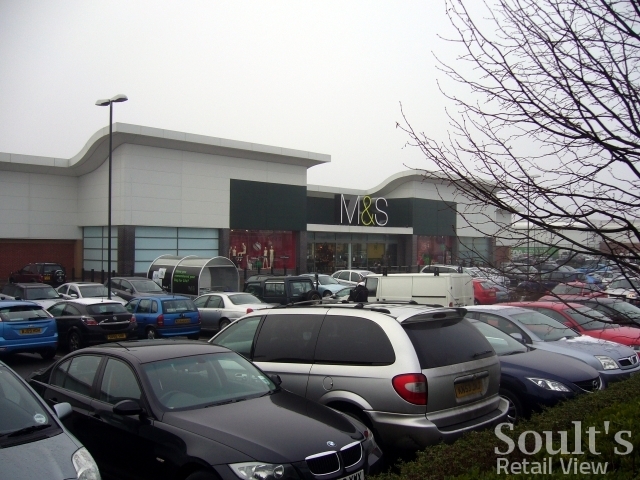 However, it’s hard to imagine the unit being empty for too long, given that the centre has several strong anchors (Bhs, M&S, Primark, New Look), a modern and appealing environment, and very few other empty shops. 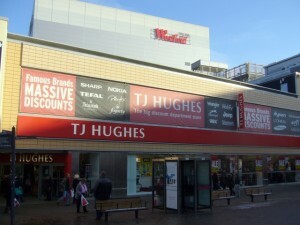 Down the road in Derby, the large former Woolworths in the Westfield shopping centre (the extended and renamed former Eagle Centre) has been taken over by TJ Hughes, and has reportedly been trading well since its opening in September. 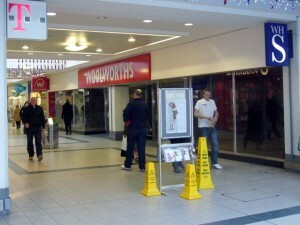 Woolworths had occupied the site back in the Eagle Centre days, but this photograph shows the extent of the changes made to the store’s London Road frontage as part of the Westfield revamp. 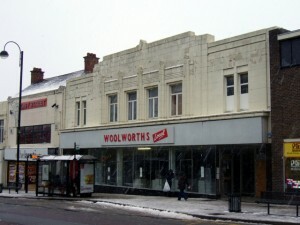 Still in Derbyshire, the old Woolies in Alfreton High Street is another of those that remains vacant. It’s quite an interesting store in that it’s a rather awkward amalgamation of a traditional-looking Woolworths building (the portion on the right) with part of the adjacent block to the left. Presumably at some point Woolies must have expanded from its original building into the premises next door? As you know, I’m generally sceptical about the merits of dividing up large former Woolworths units; in Alfreton, however, I can’t help thinking that it would really enhance the streetscape to split this property back into two separate shops – or at least to install a new shopfront that is more sympathetic to the contrasting heights and styles of the two buildings. Down the road in Church Street in Ripley, Derbyshire, the inclusion of the property above in this blog is again something of a cheat, given that it has not been a Woolworths store for many years. There’s a personal story behind this store though, in that my grandparents (and much of my family) lived in Ripley during my childhood, and I can well remember visiting Ripley’s Woolies with my gran and parents. 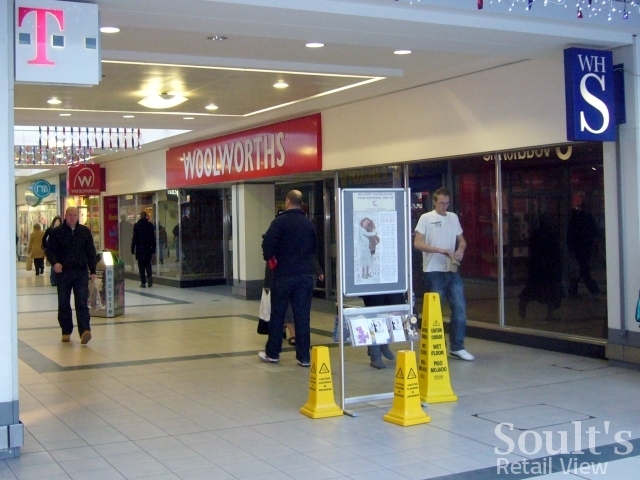 When the store shut (in January 1990, I believe), I can still recall my gran grumbling about the then state of Ripley’s town centre, recognising the symbolic importance – and the humiliation, almost – of the town losing its Woolworths. Twenty years on, however, you might argue that Ripley has had the last laugh. 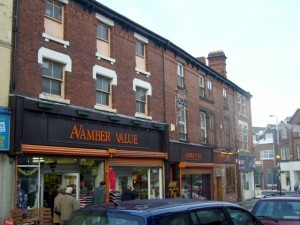 When Woolworths closed, the long-established Amber Value store – then occupying the narrow, two-bay property that you see in the middle of the picture above – extended into the much larger Woolworths premises next door (the left-hand building in the photo), increasing its floor area several times over as a result. Since then, Amber Value has continued to trade successfully from the site, offering an eclectic but highly useful range of household items, such as homewares, gardening products, stationery and toiletries. 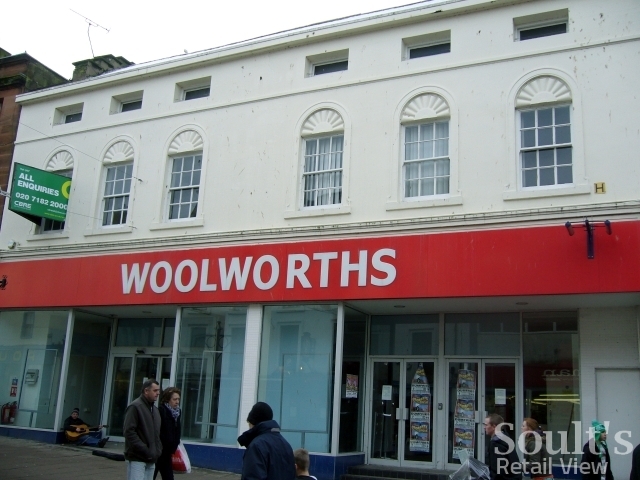 Today, the store is rightly valued by local people as a place to buy items that are not readily available elsewhere in the town centre – everything, you might argue, that Woolworths used to be. Back to the more recent Woolies closures, and in nearby Heanor the old Woolworths store is occupied by a Lighthouse charity shop, though only on a short-term basis judging by the continued presence of a ‘To Let’ sign. 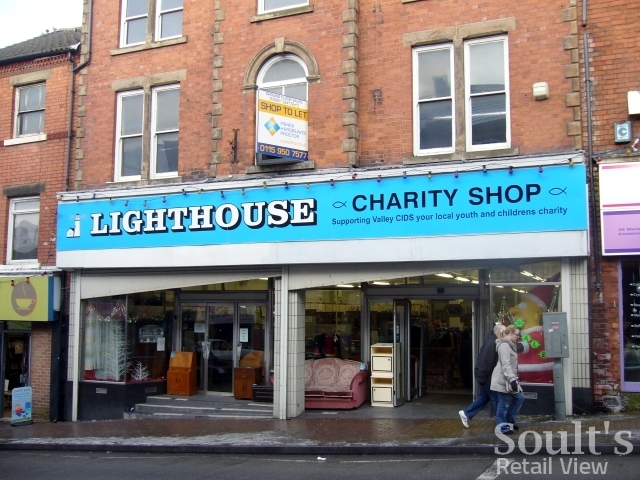 I wasn’t familiar with this enterprise prior to my visit, but I understand that Lighthouse is a growing chain of charity shops across Derbyshire operated by Valley CIDS, a Christian charity “that is committed to building and strengthening community in and around Derbyshire”, and which works “to support children and families through outreach work in schools and the wider community”. 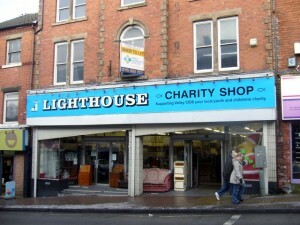 As has happened in Burnley – where the YMCA has turned the 16,000 sqft former Woolworths into the largest charity superstore in the country – there are inevitably questions about how effective a charity shop can be in enhancing the fortunes of a town centre, particularly in the aftermath of an important Woolworths store being lost. As a shorter-term measure, however, using such units to promote beneficial charity work is surely preferable to the properties lying empty. The two remaining former Woolies featured here are indeed both stores that have yet to find a new occupant. The first, in Dumfries, was reported back in September as being ‘under offer’, though there was no evidence of anything happening – and a ‘To Let’ sign still in place – when I visited last week. 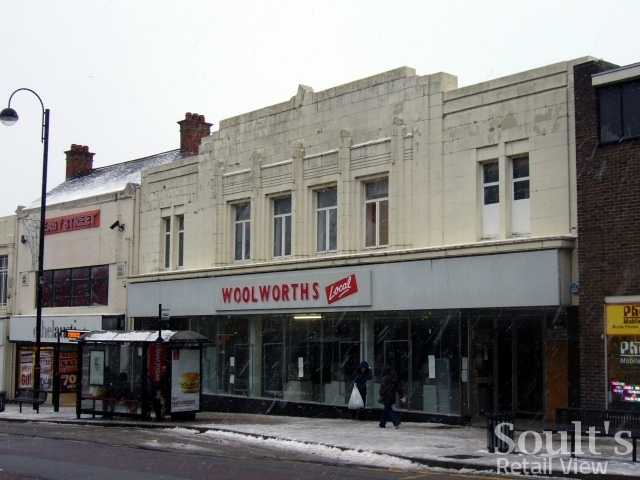 Fittingly, given the Winter Wonderland theme with which we started, the final Woolies for now is the one in Chester-le-Street, photographed – during a snow shower – just yesterday. 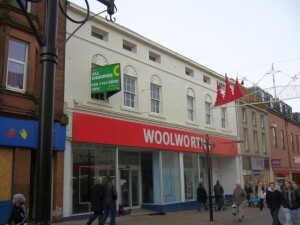 Unfortunately for Chester-le-Street town centre, the still vacant Woolworths premises in Front Street are directly opposite those of the former Co-op department store, which closed down in 2007 and is only partly reoccupied (by Peacocks, since April 2009). Throughout these changes, it’s refreshing to see Chester-le-Street Heritage Group doing its bit to both promote and document the town’s retail history, including setting up a display of old photographs of the Woolworths store during its final days. 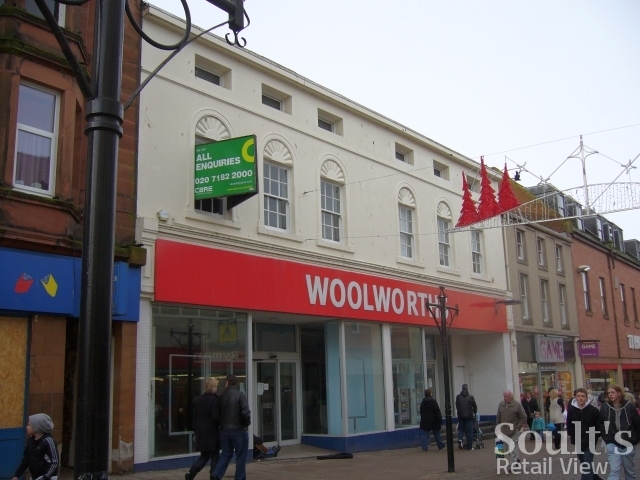 The former Woolworths store is certainly an attractive building in a very central location within Chester-le-Street, so I’d be surprised if the Heritage Group didn’t have some good news to report upon and document during 2010. Are you sure Thomas? Last time I was in Chester-le-Street it had already reopened as a B&M Bargains. I think there is another possible reason for charity shops occupying former Woolworths branches on a temporary basis. If the shop stands empty, then the landlord has to pay rates on it. But if it is occupied by a charity, then no rates are payable at all. That would appear to provide a financial motive to the landlord to let a charity occupy the shop pending a commercial tenant being found – even if it is rent free. 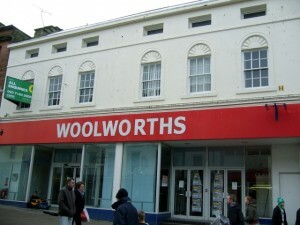 At one stage (in the 80’s to 90’s), a number of profitable Woolworths stores were closed and sold (at one time they owned most of the freeholds debt-free) to raise capital for other ventures as part of a strategy which some likened to selling the family silver. Ripley was closed in that era, and that might well have been the reason why. Hi Keith, thanks for your comments! This must be example of where the closure list was incorrect – I seem to recall that it did include some stores that had, in fact, already shut. It was the town centre store that shut on 2 January 2009. I am not aware of the closure date on the Town Centre store however.